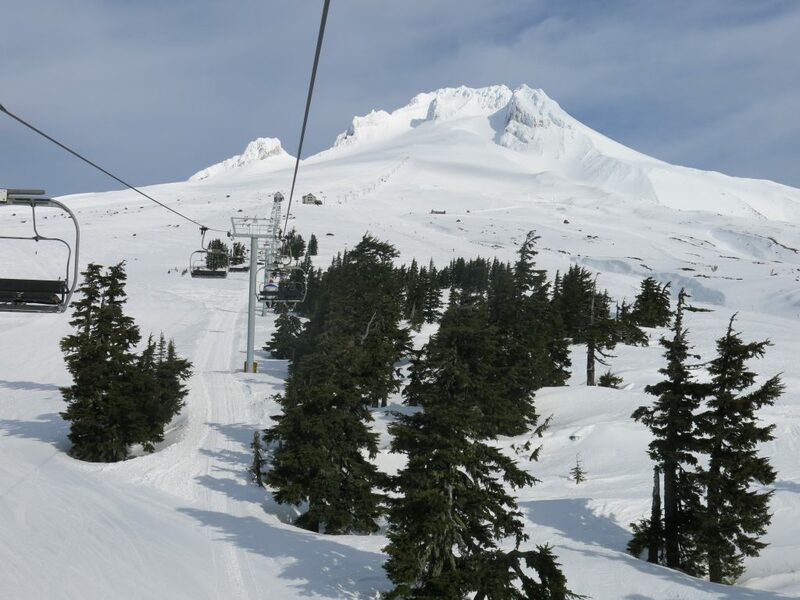 Timberline is mostly known for year-round skiing on the Palmer snowfield and the historic Timberline lodge, which apparently sees more than 2-million visitors a year, making it one of Oregon’s biggest tourist attractions. 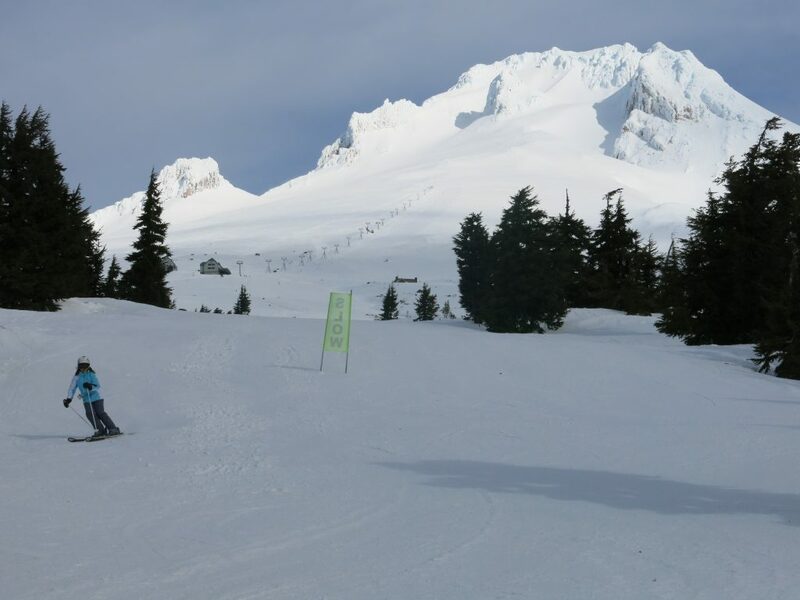 We skied Timberline on our swing by Mt. Hood on the way up to British Columbia in 2017. 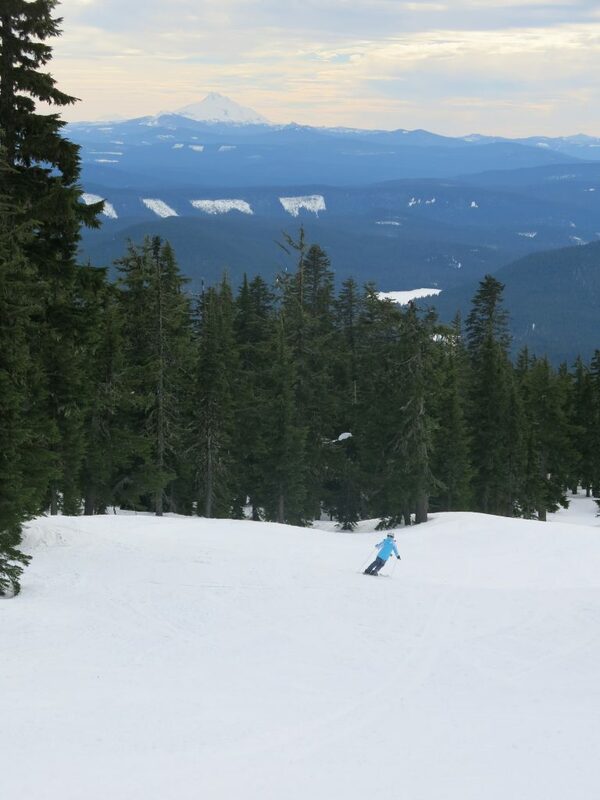 Timberline and Mt. Hood Meadows are almost adjoining but you would have to cross a large canyon to get from one to the other and they will probably never be joined because of that obstacle. 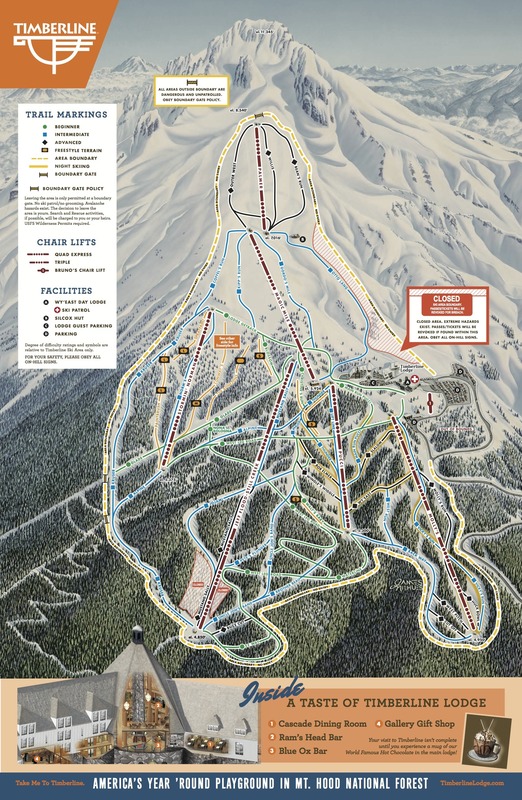 We had high hopes for this place because there are 5 high-speed quads and the map shows a lot of intermediate terrain. Unfortunately the reality was a bit different because we found the trail markings to be about 1 level too high, meaning that a blue run is actually easy, and green runs are just steep enough to get going but not much more. Starting on the most difficult lift, Molly’s. This had some nice groomed cruisers through the trees, but it’s pretty short on vertical and we were done with it pretty quickly. Next to that, Pucci is very short on vertical but has some short steeper shots here and there. 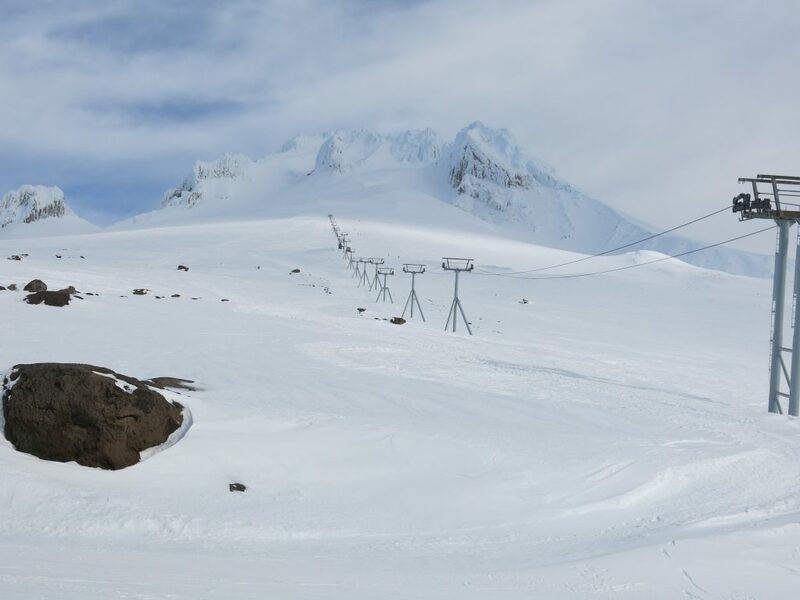 Next to the west is the Jeff Flood lift is the newest lift at Timberline and goes to the lowest point on the mountain. Again, lack of steepness makes this a quick stop, but one of our best runs was a top-to-bottom from the top of Miracle Mile to the bottom of Jeff Flood on Kruser and we did that a couple of times. Next is Stormin Norman which is mostly dedicated to terrain parks so we only found one short flat blue worth skiing there other than the great run down Kruzer. We spent most of our time on Miracle Mile, skiing every run up there 2 or more times. 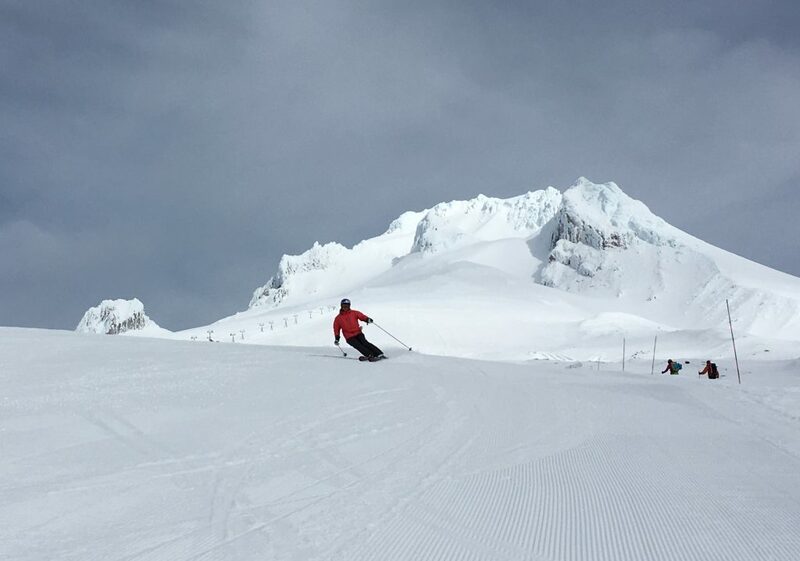 It’s largely above timberline with enormously wide easy groomed blues. The views up there are fantastic and it’s really the best part of the experience. Above that the Palmer lift doesn’t even have chairs on it in the winter, but they do open that up in spring and summer. It’s marked black but that’s a stretch and we didn’t even get to ski it because the snowcat that serves that terrain in the winter wasn’t running for some reason. 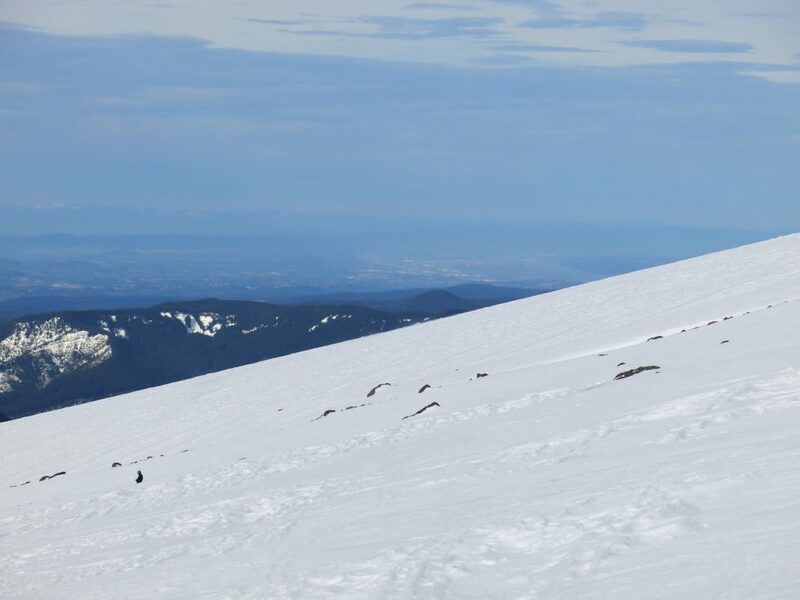 There were a ton of people actually hiking up the 1,500 vertical to ski down, or even continuing on to the 11,245′ summit of Mt. Hood. That would be a 4,250′ climb from the top of Miracle Mile! 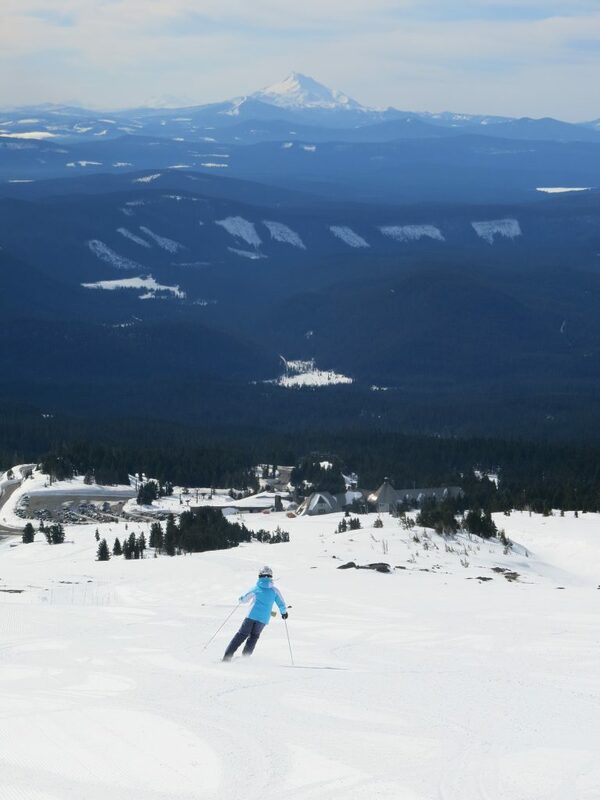 The best part about the experience was lunch at the Timberline lodge. It’s an interesting historic hotel built in 1939. To preserve the wood floors you have to take your ski boots off when you go in before going upstairs to the restaurant. Good food was found there, and great views, so we spent a long time at lunch. This is hands down the flattest place we have skied on the list thus far. 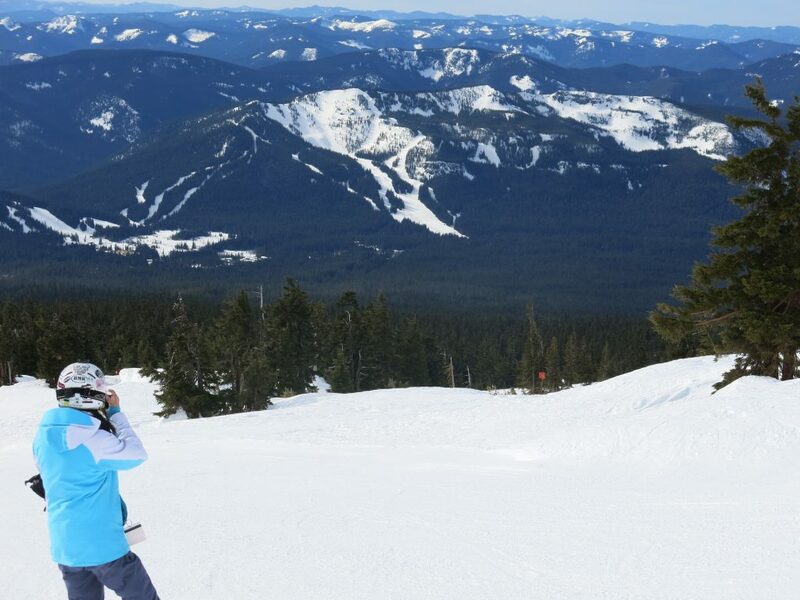 The views are great, and the historic lodge is an awesome place to have lunch, but the skiing is just not what we are looking for.